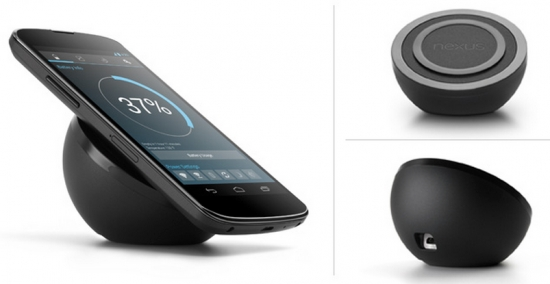 Nexus 4 wireless charger available now | Android Blast! Google has finally made the Nexus 4 wireless charging orb available in the Google Play Store. If you want to take a shot at charing your Nexus 4 wirelessly, you can pick one up for $60 today. The Play Store says it will ship "soon," and by soon they mean in less than a week. In addition to being a wireless charger, the Qi inductive charger doubles as a stand of sorts. You can mount your phone in portrait or landscape for easy viewing. Head on over to the Google Play Store at the source link below to pick one up.